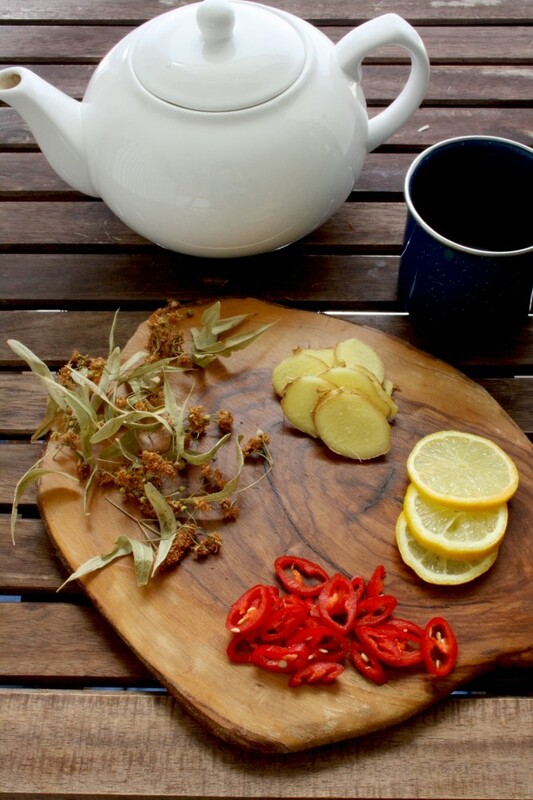 Natural Flu Remedy Tea made of 4 powerful anti-inflammatory ingredients: ginger, lemon, hot chili and linden blossom. 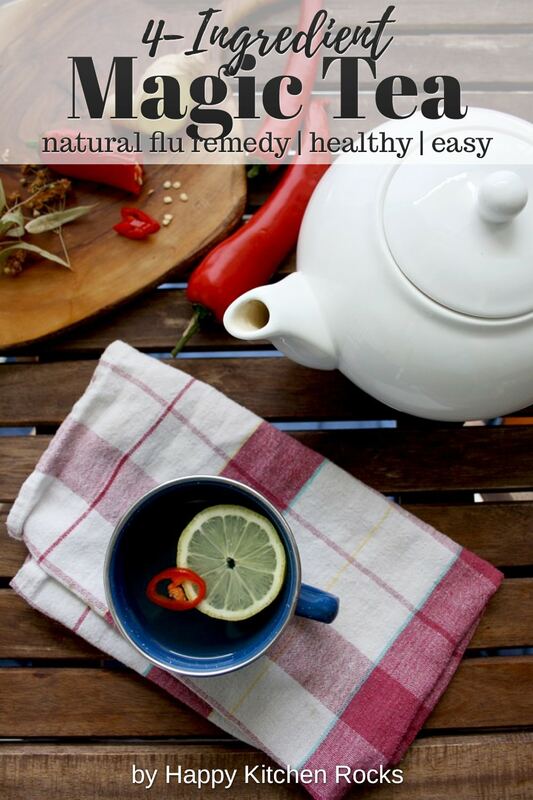 It helps to fight flu or cold fast and effective in a natural way. 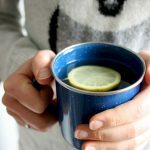 This magic flu remedy is the only reason I’m able to write this post right now, instead of staying in bed incapable of doing anything other than watching TV. I always use this tea when I catch a cold or flu and it helps to relieve the symptoms every time. Stay at home, relax, sleep, do nothing and allow yourself to be a couch potato. It helps your body to concentrate its energy on fight the infection, so you will recover sooner. 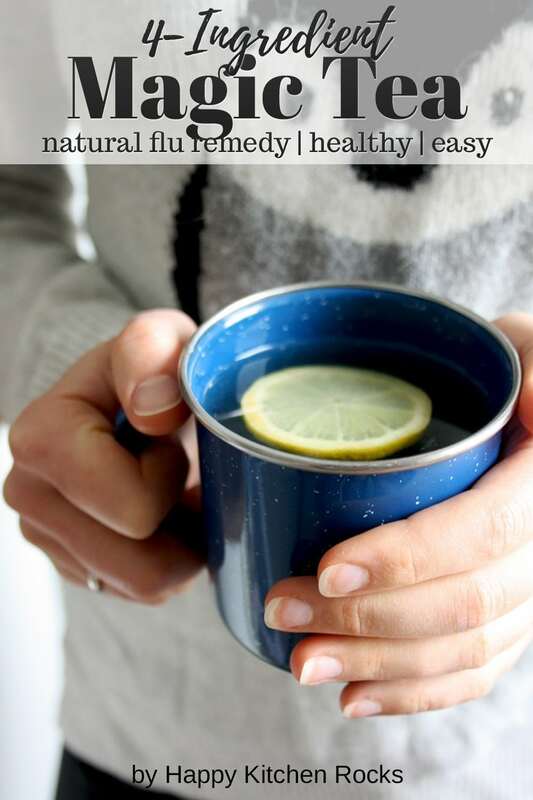 Drink a lot of liquid, preferably warm or hot (see the recipe for my flu remedy tea below) to relieve the nasal congestion and soothe the inflammation. Keep your diet healthy and rich in infection-fighting food: eat less sugar and processed food and more vegetables and fruits (especially garlic, onion, chili peppers, carrots, ginger, lemon, bananas, etc), probiotics (kimchi, sauerkraut, yoghurt, kefir), whole grains (oats, barley), food rich in vitamin D (mushroom, fish, eggs) and old good chicken soup. To open clogged airways, consider steam inhalations. I usually boil a pot of water, add a couple of drops of essential oils (eucalyptus, tea tree, lavender, peppermint, pine, etc) and breath over it, covering my head with a towel. 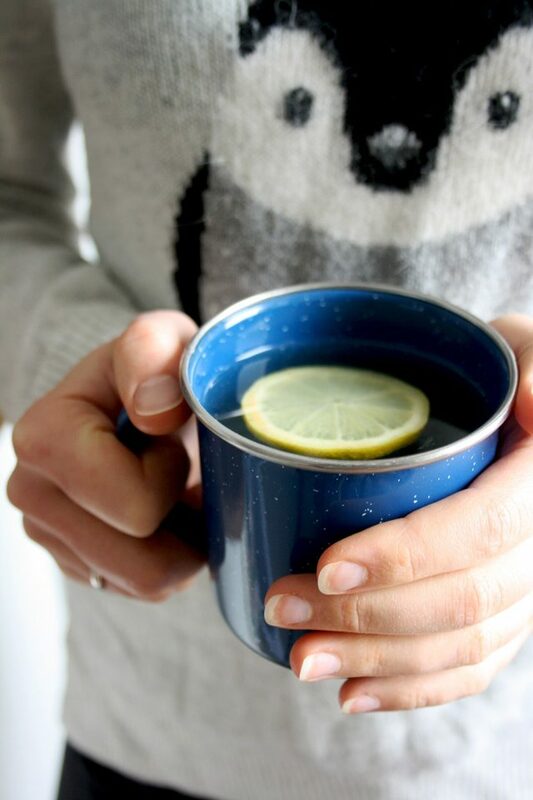 To moisten a sore throat, it’s good to gargle using warm salty water or sage tea. Salty water rinsing also helps to break nasal congestion. If you feel like these measures are not enough, or you have persistent high fever, it might be a good idea to see a doctor though. It has anti-inflammatory, anti-bacterial, anti-viral and antioxidant effects, being one of the most effective remedies for curing flu. It also acts as a natural analgesic, helping relieve the pain and irritation caused by flu. Moreover, it regulates your digestive system, which is upset during flu. Lemon is extremely beneficial for relieving respiratory symptoms. Just as ginger, it has anti-bacterial and anti-viral effects, speeding up the healing process. Among other health properties, lemon is known for its high vitamin C content, that helps to support the body’s natural defense mechanism. 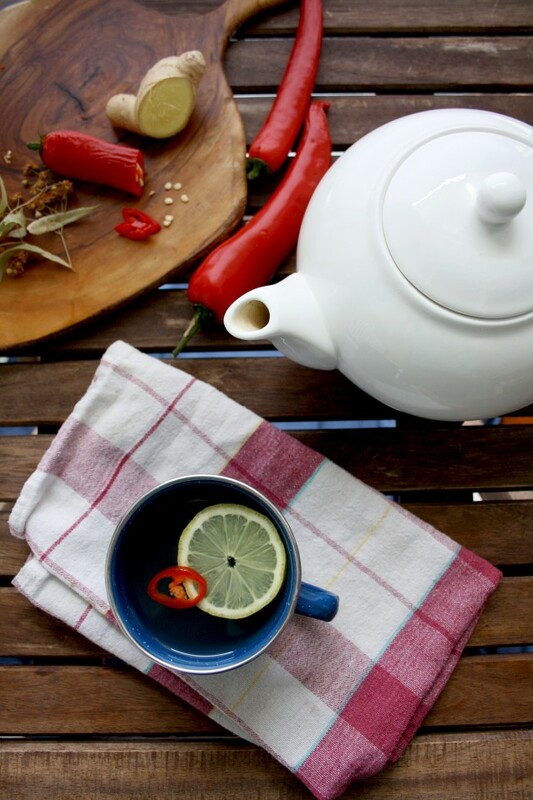 Spicing up your natural flu remedy tea with chili pepper helps you to relieve a stuffy nose, as well as soothe a sore throat. They will help you to reduce pain and swelling. Furthermore, hot chili peppers boost your immune system by making you sweat and increasing anti-viral activity in your body. This is one of the lesser-known flu fighters, although it’s one of the oldest remedies with wonderful healing properties, used for centuries in Russia and Europe. 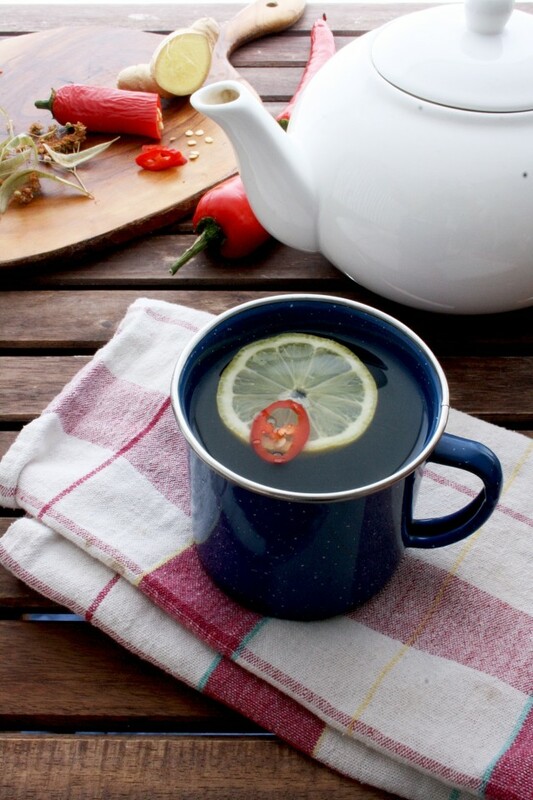 Similar to hot chilies, it acts as a natural detoxifier, promoting sweating and therefore decreasing the fever. Moreover, it helps your nervous system to relax and cures anxiety, insomnia, muscle spasms and headaches. Linden blossom tea relieves respiratory problems, such as cough, sore throat and nasal congestion. Thanks to Amazon, you can order your linden blossom online in any part of the world. Otherwise, collect it in late spring, like I did last year. 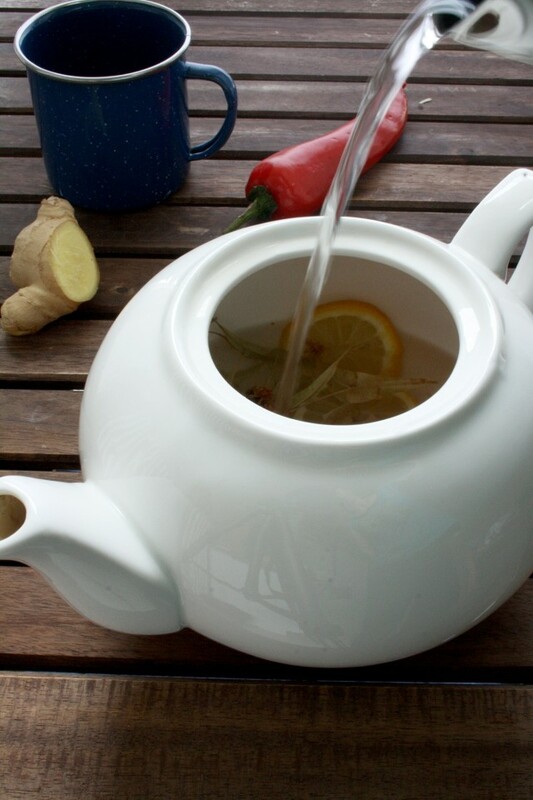 Put ginger, lemon, chili slices and linden blossom in a teapot. Add boiling water and let stand for 10 minutes. Add honey if desired. Get well soon! How do you cure your flues? Leave a comment below!